"One hastens to southern Africa to chase the giraffe; but surely that is not the game he would be after. " Thoreau argued that we should explore our inner worlds of self-knowledge rather than rushing after superficial travel experiences. Perhaps ignoring his advice, I am visiting Cape Town, South Africa, for 10 days. I am learning about the world’s greatest concentration of plant species, meeting conservation biology colleagues, and trying to develop a conservation biology textbook for Africa. On my second day in Cape Town, I visited a section of fynbos, a lowland shrub ecosystem with an amazing diversity of plants species, many of which have very restricted ranges. The fynbos has over 9000 species, most of which are found nowhere else in the world, in an area the size of the Netherlands. Table Mountain is a recognizable feature, towering above the city of Cape Town. The fynbos is especially noteworthy for an abundance of species in the Proteaceae with beautiful flowers. This particular individual was planted in a restored area from which non-native invasive species have been removed. 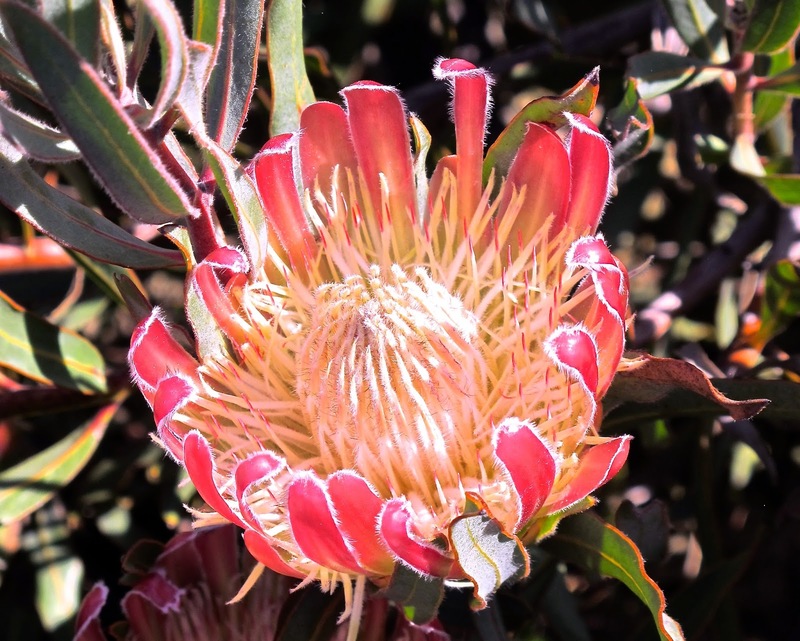 The characteristic flowering Protea head with hundreds of individual flowers. 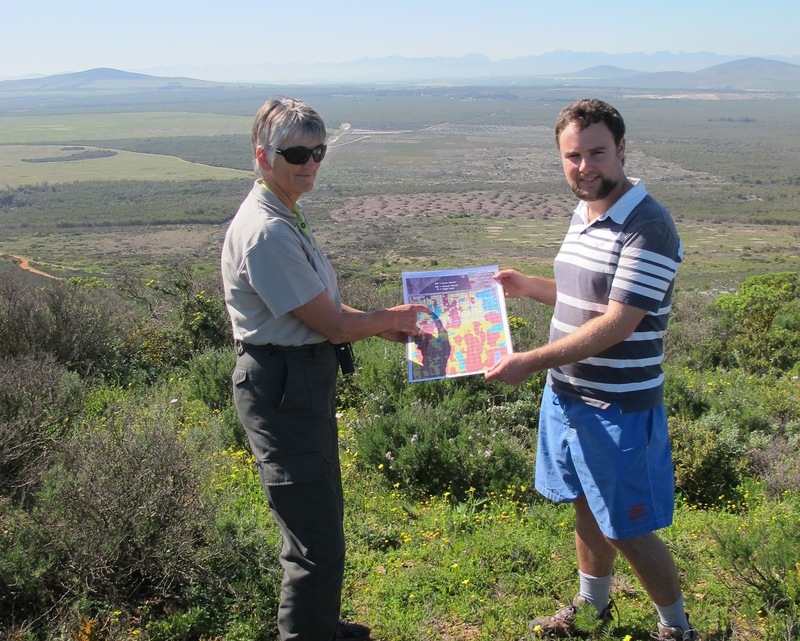 Above, two colleagues hold a map showing places where stands of non-native invasive Acacia shrubs are being removed from fynbos vegetation. Areas cleared of Acacia shrubs can be seen in the background. 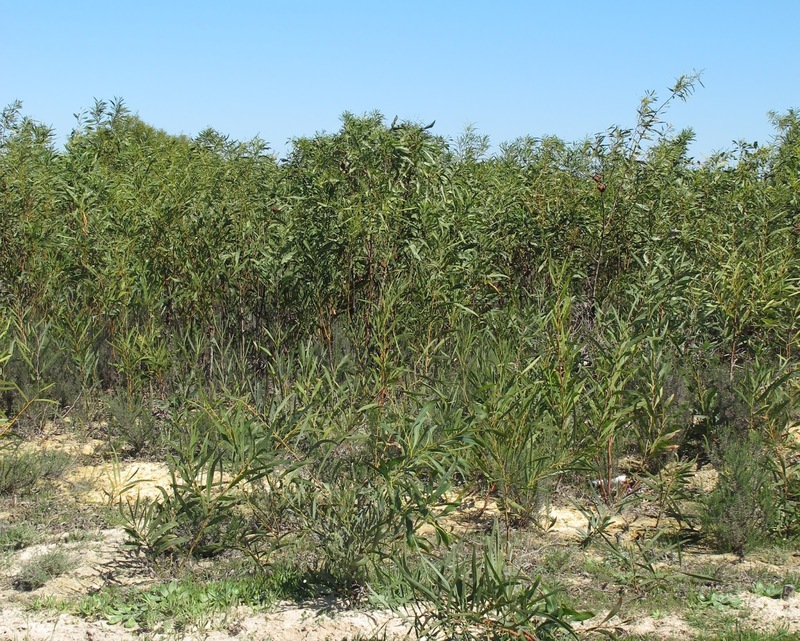 Invasive Acacia shrubs can form a pure stand and outcompete native fynbos species. 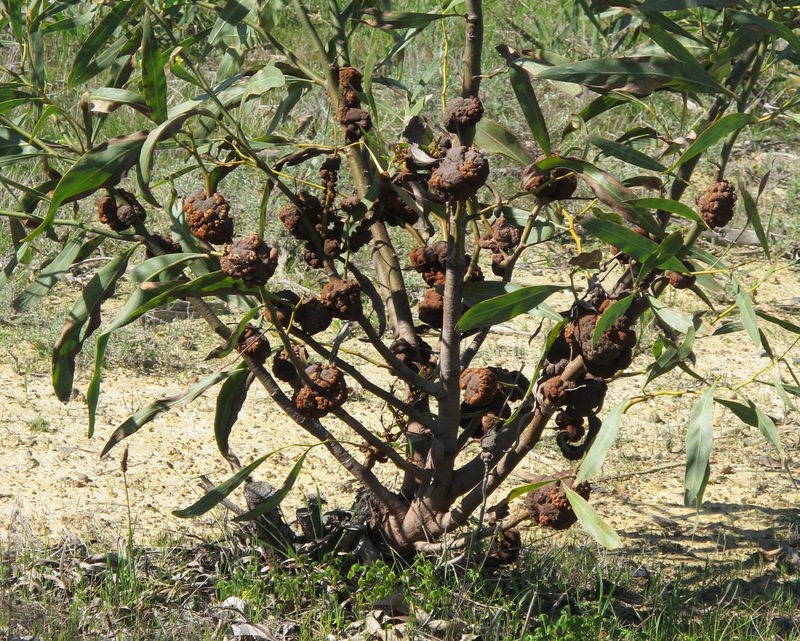 Methods to control invasive Acacia shrubs include (1) spreading a fungal disease that forms growths on the stems and weakens the plant, (2) releasing a beetle that eats its seeds, and (3) chopping down and burning plants. "Going a-berrying implies more things than eating the berries"
Climate change may be affecting the fruiting times of plants in New England. If so, this would have consequences for the birds that eat fleshy fruit during their time of migration. For the past year, Amanda Gallinat, Richard Primack and I have been evaluating herbarium specimens for about 60 common native and nonnative invasive species in New England for fruit ripening times. To understand how fruiting times have changed over time due to a warming climate, we have examined these museum specimens, which range in collection dates from the 1850's to present. In addition to the date the species was collected, each label on a specimen also provides information on the collector and location where the specimen was collected. We are especially interested to know if native species and invasive species are responding to climate change differently across the New England landscape. "October is the month of painted leaves. Their rich glow now flashes round the world." 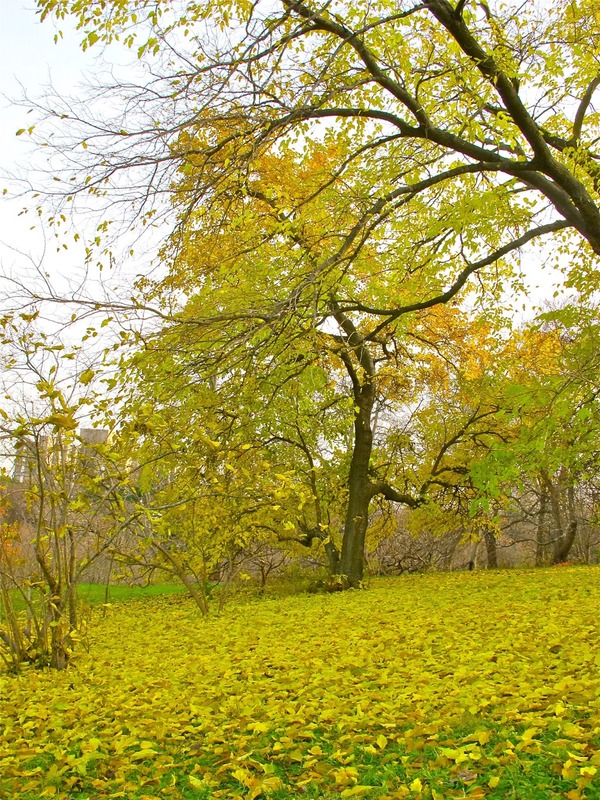 In recent years, the Primack lab has worked in partnership with 5 other research groups at botanic gardens around the world to monitor the timing of leaf senescence (leaf color change and leaf drop) across a wide range of species. The results of this international collaboration have been published in Annals of Botany, in a paper led by Zoe Panchen of Carleton University. 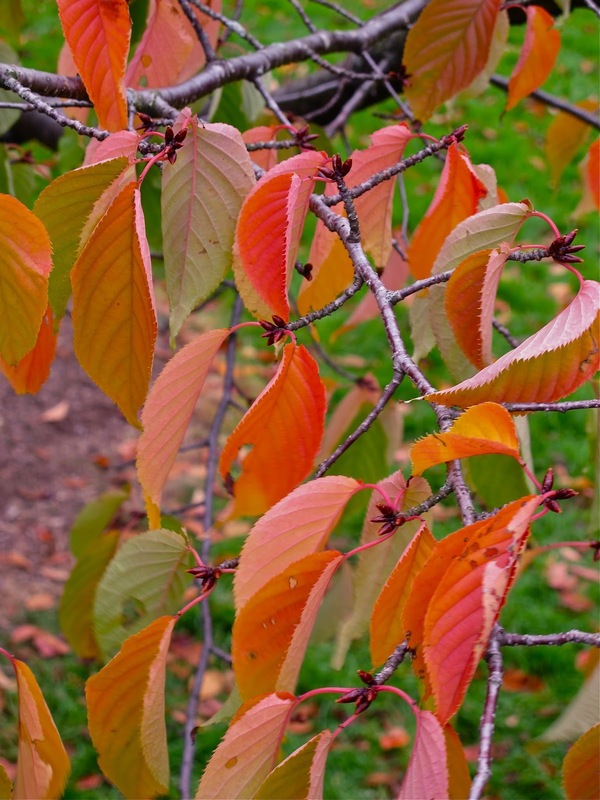 Prunus sargentii leaves changing from green to yellow and red coloration. The paper, entitled "Substantial variation in leaf senescence times among 1360 temperate woody plant species: implications for phenology and ecosystem processes" demonstrates that autumn leaf senescence dates vary broadly between species and botanic gardens. Within each botanic garden, the sequence of leaf senescence was fairly consistent between years, but did not have a strong phylogenetic signal. These results are in stark contrast with the results of a similar study on spring leaf-out times that our botanic garden collaborative published last year, which showed that the sequence of leaf-out is largely consistent between years and locations, and contains strong phylogenetic patterns. We conclude that while leaf-out is strongly driven by spring temperatures, the lack of patterns in leaf senescence timing means it is likely driven by a combination of local environmental factors, including soil moisture, frost, wind, and temperature.